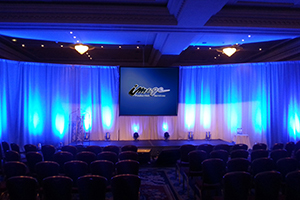 Image Production Services is the go-to scenic company. Our in-house fabrication shop and set design department is respected for creative concepts and precise executions. Image Production Services has produced staging and scenery for both small and large entities throughout the country and is the staging and scenery provider on which producers rely. 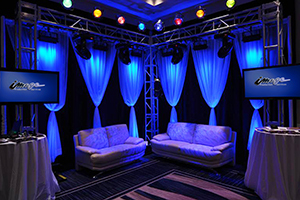 We rent a variety of pipe and drape configurations for events and expos. Our expert professionals will deliver, install, and dismantle your pipe and drape needs skillfully, efficiently, and cost effectively. Pipe and Drape refers to pipe (aluminum or steel), fixed or adjustable telescoping vertical uprights supported by a weighted steel base, and adjustable telescopic or fixed horizontals that provide a drape support frame with removable drape panels. 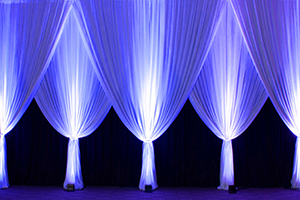 Pipe and Drape is used to divide, hide, and/or decorate a space temporarily. It is the least costly way to surround booth space at an exhibition. When the system is used for exhibition purposes and used instead of the traditional shell scheme option build time and breakdown time is significantly reduced. Pipe and drape is a great way of adding color to what would normally be a relatively plain backdrop. Often used as trade show booths, in tents, in large banquet halls and on stage; pipe and drape covers up the distracting features of the less appealing wall or window behind it. Pipe and drape is freestanding so ideal as room dividers, exhibition curtain back drape, stage theatrical backdrop, catering aisle drape and drape partitions.